One of the greatest advances in theoretical particle physics in the 20th century is Noether’s theorem. If you’ve never heard of it, you’re not alone. It’s an achievement that seldom makes it into popular titles, despite the fact that it’s arguably the greatest single achievement of mathematical physics that’s ever been made. It was conceived of by one of the unsung heroes of the field–Emmy Noether, probably the greatest woman mathematician who ever lived. What Noether’s theorem tells us is that for every symmetry of a physical system, there is a conserved quantity, and vice-versa. The conservation of energy, for instance, corresponds to symmetry in time. Conservation of momentum corresponds to the symmetry due to translation through space. What Noether’s theorem essentially tells us is that when you’re trying to build a working theory of physics, what really counts are the symmetries. Nail the symmetries and you’ve essentially nailed the problem. The problem for digital physics is that Noether’s theorem specifically relates to differentiable symmetries. In other words, ones that change smoothly. For symmetries that don’t change smoothly, all bets are off. This means that anyone trying to use a discrete, computational system to model physics is hamstrung right out of the gate. In order to bridge this gulf, it seems to me that you need some way of describing computation in terms of symmetries, or symmetries in terms of computation. Either way, you need some nice formal way of putting the two notions on the same footing so that a meaningful, discretized version of Noether’s theorem can be derived. In other words, you need some kind of super-math that slides right in there between calculus and the theory of computation. Though the link may not yet be obvious, this was where I was going with my recent post on Simplicity and Turing machines. But what does simplicity have to do with symmetry? Plenty, I suspect. I propose that we try to bridge the gulf between symmetry and computation with an idea that has elements of both: the idea of a partial symmetry. Any time you have a system that displays a symmetry, there is informational redundancy in it. Because there is redundancy in it, you can look at that system as the outcome of some sequence of copying operations applied to an initial seed from which redundancy is missing. Consider a clock face. We can treat the clock as a shape that happens to have twelve-fold symmetry, or we can think of it as a segment for describing a single hour that’s been replicated twelve times. This isn’t how we normally think about symmetry, but in spirit it’s not that far from a more familiar idea that mathematicians use called a group action. However, if your copying operation doesn’t preserve all the information in the initial seed, you don’t have a full symmetry. 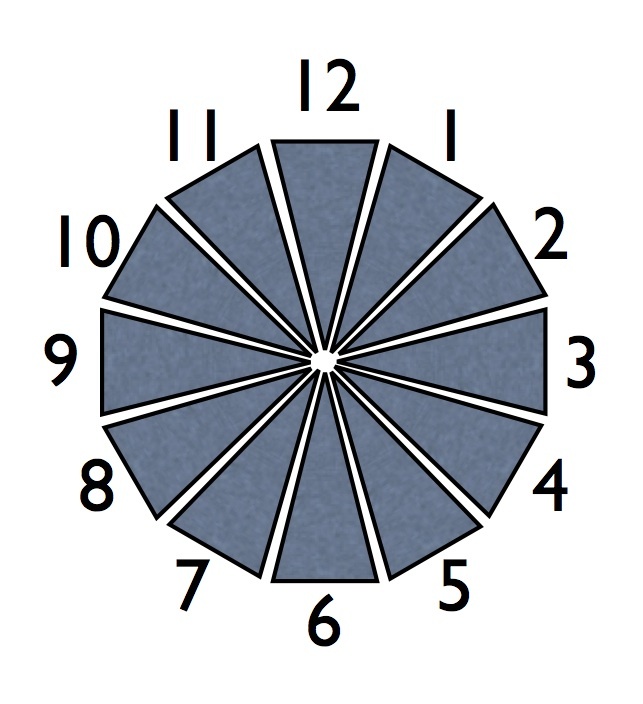 Consider what happens if, instead of taking those clock segments and lining them up in a circle, you copy and move with each step in such a way that a part of each segment is hidden. You still end up with something that’s got a lot of the properties of a symmetric object, but it’s not fully symmetric. Furthermore, as soon as you do this, the ordering of the sequence of copying operations suddenly matters. 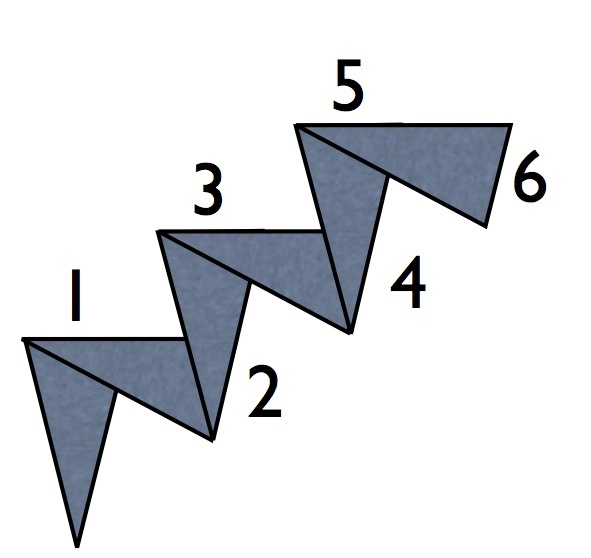 My proposal is that partial symmetry is equivalent to computation. And that armed with this idea, we can start to look at the symmetries that appear in nature in a new light. That might sound like a bit of a stretch, but in later posts I’m going to try to show you how it works. In my last post, I talked about Lorentz invariance. I got some great feedback. (Thank you Keir.) And from that, it seems pretty clear that relativity is not something I can pass over lightly. I’m going to go over the rest of how to capture special relativity in networks as carefully as I can. Last time, I suggested that you could duplicate relativistic effects by creating a hidden, rolled-up dimension to capture the notion of subjective time. One of the comments I got was that this seemed to imply that time was going round in a tiny loop, which isn’t what we experience. Fair point. What I was aiming to say was that the act of traversing the hidden dimension produces the sensation of subjective time, not that the hidden direction was actually a compact time axis. A fine-grained distinction, I grant you. In fact, whichever way you cut it, having to have this little extra dimension isn’t very satisfactory. We’d like to have a way of capturing the experience of subjective time that’s not dependent on it. Not least because creating networks that contain extra compact dimensions is complicated. So how can we do better? We can do better by making the extra direction s be a feature of particles, rather than a feature of spacetime itself. In other words, if a particle’s not there, the extra direction isn’t there. And only particles that have mass can create this extra direction. For those of you familiar with the idea of the Higgs boson, this might sound familiar. For the Higgs field, we imply that there’s a special field everywhere in space, except where a particle happens to be. The gap in that field creates wiggle-room that the the particle can use to create the phenomenon of mass. The way we currently understand physics, the mass that’s endowed by the Higgs field has nothing to do with the mass endowed by relativistic effects. But wouldn’t it be nice if we could achieve both kinds of mass with a single mechanism? Maybe we can. If we’re implying, though, that particles carry the extra direction around with them, how can that possibly work? How can a particle have a dimension inside it? What would that even mean? It turns out we don’t need an extra dimension. We just need the particle to create some wiggle-room, the same as for the Higgs field. We can imagine this by creating a particle inside another particle. The way we do this is by creating a relation between the inner particle and the outer one that people don’t usually use in physics, but which is very easy to do with networks. Let’s call the inner particle the ant. The ant is always racing about at fixed speed. The outer particle, we’re going to call the pipe-elf. The job of the pipe-elf is to make sure that the ant has something to walk on (some wriggle-room). Whenever the ant reaches the front of the pipe, the pipe-elf builds a new piece of pipe and sticks it on the front so that the ant has somewhere to go. At each time-step in our simulation, the ant either reaches the front of the pipe, or it does not. If it doesn’t reach the front, the elf has some time on his hands. He can do things like receive phone-calls or clear up the old bits of pipe he’s left lying around. However, while the ant is keeping him busy, doing these things is impossible. Now, let’s think about the different possible paths the ant can take. If it’s travelling straight down the pipe, the elf will never have any free-time. He’s going to be building new pipe-segments as fast as he can. However, if the ant is just racing around and around near the front of the pipe like a hamster on a wheel, the elf can do whatever he likes. He has all the time in the world. In other words, so far as the elf is concerned, he’s either experiencing lots of free time, moving very fast, or something in between. Let’s call the phone-calls that the elf gets photons, or messenger particles. Let’s call the amount of old pipe left hanging about the relativistic mass of the particle. And let’s say that the ant is the one who’s really in charge. Stopping this particle means you have to find and bump into the ant. When you do that, and only then, you collapse all the elf’s pipe-segments down on top of you. Unless you meet the ant, the pipe sections are like so much smoke. You can walk through them without knowing that they’re there. This pretty much covers the bases of what we need for special relativity. The set of angles that the ant can walk at exactly corresponds to the set of possible directions we might need to cover to model special relativity. The ant is a particle constrained by its context, just as for the Higgs field, and so travelling on a helical path. The only wacky thing here is the notion that the elf can only interact with the rest of the universe when it’s not building pipe segments. But that nicely covers the relation between velocity and time. And we don’t need a special network for the ant-elf pair to travel around on. A perfectly ordinary spatial network will do. Hence, we can imagine a universe filled with lengths of invisible, untouchable pipe arcing through the void, each filled with whizzing ants. Do I think that the universe actually looks this way? No. This isn’t a theory, it’s a model. But what it does give us is the behavior described by special relativity happening against a discrete background, without a hair of Minkowski space in sight. Not everyone may be cheering just yet, I admit. Anyone familiar with special relativity may in fact be writing in their chair by now because I haven’t mentioned Lorentz-contraction–the effect that special relativity has on distance. The way that we’re used to thinking about relativity, the length of objects in their direction of travel is affected just as much as the time they experience. But this omission is on purpose. In this model, you don’t need Lorentz-contraction. It’s not there. That may sound counter-intuitive, but I assure you, the math works out. The observed contraction is the same. And the quantization of the background doesn’t even give you any problems when you change reference frame. Next time, I’ll try to explain why. I may even get round to telling you how quantum mechanics might fit in this picture. In my last post, I showed off an algorithm that could create nicely irregular networks with integer dimension two, without using geometric information. In other words, I made lumpy spheres. While I’m proud of this result, it doesn’t look much like the kind of spacetime networks that are used in almost all branches of discrete physics. That’s because the dimension of time is missing. And, as anyone who’s read a little Einstein will tell you, time and space are part of the same thing. They can’t really be uncoupled. Except, of course, they can be uncoupled. It’s dead easy. It’s just that for most of the math that physicists do, it makes more sense to wedge them together. I’ve briefly outlined in previous posts the way in which space and time can be unpacked from each other. However, after a fun conversation with a very math literate friend the other day revealed to me that I haven’t really done a good enough job of explaining. In this post, I’m going to try to set that straight. Where t is time, x, y, and z are the familiar dimensions of space, and s is the ‘spacetime interval’. What this relation says is that if someone is moving toward or away from you, how fast they’re doing it is going to affect how you both perceive time to be passing. To illustrate this, we can invoke a classic example from science fiction. If you get on a spaceship and make a very fast trip to a distant star (let’s call it Distantia) and back at almost light speed, when you return almost no time will have passed for you. However, for us, it will seem as if decades have gone by. What matters here is who does the accelerating. If you go to Distantia, and a week later I join you there, then we will both perceive the same amount of elapsed time. At first, it’s not clear that we’ve done anything here. It’s the same formula as before, just the other way around. But let’s ask ourselves what the terms in this expression actually mean. What is a spacetime interval? What is the Minkowski relation actually saying? It’s saying that for a pair of travelers approaching me from the same place, that the subjective experience of time needed to reach me will depend on how fast they’re going. In other words, what the spacetime interval defines is the experience of subjective time for those travelers, as taken from my perspective. Another way to think about this is that by turning the normal formula for spacetime around, we’ve created an external reference frame. Let’s call it Father Christmas’s reference frame. Nobody in the universe has access to FC’s frame. As far as they’re concerned, Minkowski space works are usual. All frames of reference are still equal and the math is exactly the same. Only FC can see this special view of the universe, which is handy as he needs to visit a very large number of chimneys very quickly and surprise everyone at Christmas. The awesome thing for Father Christmas is that the universe has an unambiguous, objective geometry that encompasses everything that’s going on, and has this natty extra dimension s. For FC, creating a discrete model of spacetime is a breeze. He just divides everything up into a locally connected network. End of problem. But hang on, we can’t see a direction s. And we haven’t detected it in any experiments! So how can I claim that this is a solution to the problem of relativity? It turns out that the physicists solved this for us years ago when they came up with something called Kaluza-Klein theory. The trick is that we roll the s direction up very tight into a little circle so that it’s invisible to us, but important at small scales. Sound familiar? It should do, this is exactly the trick that they use to make String Theory work. In fact, there’s exactly nothing new here. What I’m describing is old physics. If you can’t believe in a compact direction for s, you have to throw String Theory away too! Note that this only works for simulations that are isotropic (the same in all directions). This means that, unless you’re being super clever, the same trick can’t work for cellular automata. So where does this leave us? With a really nice tool for making thorny spacetime problems go away. However, we still need to build networks that have the extra magic direction s, and it still needs to magically relate to subjectively experienced time. The network we started off doesn’t have that direction, and we don’t have a way to encode the experience of particles, so lots more work is needed. But in the next post in this series, I’ll show you how to pull these tricks off too.